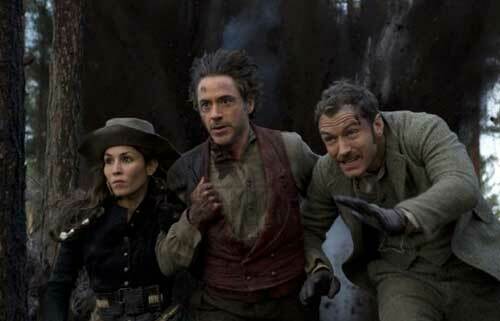 After his rollicking 2009 re-introduction of the classic British detective, director Guy Ritchie (Lock, Stock and Two Smoking Barrels) delivered an equally action-packed adventure in 2011 with Sherlock Holmes: A Game of Shadows. This time around, Holmes (played with gusto by Robert Downey Jr., Iron Man 2) and his straight-laced sidekick Dr. Watson (the amusing Jude Law, Hugo) is pitted against his arch nemesis Professor Moriarty (Jared Harris, TV’s Fringe). With the help of a gypsy fortune teller (Noomi Rapace, The Girl With the Dragon Tattoo), Holmes and Watson must connect the dots between a scandal that takes down an Indian cotton tycoon, the death of a Chinese opium trader, bombings in Strasbourg and Vienna and the murder of an American steel magnate. The mystery takes them out of London, to France, Germany and Switzerland. A big hit in theaters, PG-13-rated A Game of Shadows also stars Stephen Fry (TV’s Bones), Rachel McAdams (Midnight in Paris) and Eddie Marsan (War Horse). The action adventure film grossed $187.6 million but was more loved by moviegoers than critics. The New Yorker‘s Bruce Diones said the movie is “complete trash and makes a mockery of Holmes’s vaunted deductive reasoning.” Okay! But The Standard‘s Matt Neal called Game of Shadows “exciting, witty and great fun.” We at Disc Dish agree with Neal. “Maximum Movie Mode: Inside the Mind of Sherlock Holmes,” hosted by Downey Jr. The Blu-ray also offers an UltraViolet digital copy that can be downloaded or streamed, redeemable through June 12, 2014.